This article is about Deck Commands in Kingdom Hearts Re:coded. You may be looking for Deck Commands in Kingdom Hearts Birth by Sleep or Deck Commands in Kingdom Hearts 3D: Dream Drop Distance. The Command Matrix (コマンドマトリックス, Komando Matorikkusu?) is the command system in Kingdom Hearts Re:coded. Before deck commands can be used in battle and in the field, they need to be installed in the Command Matrix. The commands that can be installed are limited by the amount of Memory each command takes up and the number of available slot groups in the Command Deck. 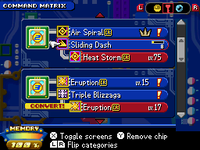 Three slot groups are available initially, with up to five additional slot groups that can be unlocked by hooking up chips to Command Expansions in the Stat Matrix. The Command Matrix screen, showing commands that are ready to be converted. A slot group consists of two blue slots and one red slot. If commands are installed in the two blue slots, they will be "test-converted" into a new command, which appears in the red slot and the Command Deck. If the two blue slots are filled with compatible commands, indicated by a yellow highlight in the selection menu, the red slot will contain a wholly different command; otherwise the red slot will simply contain a stronger version of the command in the first blue slot. Defeating enemies earns Command Points (CP) for all installed commands. When a command accumulates enough CP, it is marked with an exclamation point. When two marked commands are installed in adjacent blue slots, they can be permanently converted into the command that appears in the red slot. The converted command may receive an additional bonus, called an Overspec, in which it may either gain extra levels, fill the Clock gauge more quickly, or have a faster reload time. In the latter two cases, the command will be marked with a C or R symbol, respectively, next to its name. If a command has received both bonuses, it will be marked with a CR symbol. Commands can be converted over and over, but no command can exceed a maximum level of 100. Some commands can only be obtained through Command Conversion. Reborubu Bureiku?, lit. "Revolve Break") 10% Normal Punish surrounding foes with a spinning attack. Choose the Dream Shield in the Dive to the Heart; Buy for 400 munny. During the Labyrinth of Olympus Coliseum, deck command mechanics are modified drastically, in order to suit the area's turn-based gameplay system. The new mechanics involve converting and combining deck commands to unleash new ones. During Hollow Bastion I, Data-Sora can not use any commands himself, aside from item commands, due to his lack of Keyblade. Instead, deck commands are substituted into commands that Data-Sora's party members execute. Hence, activating a command causes Data-Sora to call out to the appropriate party member, who responds and then performs an alternative command. When Goofy is an active party member, Data-Sora's attack commands are each substituted into one of two Goofy commands. When Donald is an active party member, Data-Sora's magic commands are each substituted into one of two Donald commands. GūfuTabo?, lit. "Goof-Turbo") Goofy spins around, dealing damage if contact is made. Basic attack commands. GūfuTorunedo?, lit. "Goof-Tornado") Goofy dashes forward, dealing damage if contact is made. Advanced and Ultimate attack commands. DonaFaiga?, lit. "Dona-Figa") Donald casts Firaga, shooting a strong bolt of fire at foes. Basic magic commands. DonaSandaga?, lit. "Dona-Thundaga") Donald casts Thundaga, summoning several bolts of lightning to hit enemies. Advanced and Ultimate magic commands.